The Vintage Farm. Laura and Sara are mother and daughter that live in their old fashioned vintage farm. Each summer they need special help and other farmers, relatives and fiends come to help them. The most important activity is few cultures to be grown on their farm so they can sell them and with the earned money they will buy mechanization that will make their work easier. On a farm there always are activities to be done. There come different operations to be done, the land needs our time and work so it will give us what we want, different cultures to feed us, part of it to be sold and some money to be earned. If you don’t have enough people in the family to do the job, than you pay for people to work, to help you, or you ask close friends to help you. Laura and Sara are hard working ladies that love the nature. In years they live in their farm, spending whole days in giving love to the land. And that’s why, land returns with good. And, they have great plans. They don’t want to leave their work primitive, they want to grow bigger and more successful. For that, they need some money. That’s why it is very important to them to earn more money so they can buy the expensive machines. That’s how they plan to be better and better. And due to their sincere wish, they will surely succeed in the plan. Here, you can help them in the mission. Put yourself in a role of a farmer and enjoy the nature! 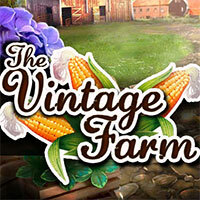 The Vintage Farm is a free online hidden object game on Hidden4Fun.